Danny Jacobs stopped George Walton in 8 rounds on Friday night displaying pinpoint accuracy with his punches and showing the looks of a very polished professional fighter. It is not a surprise that he looked so composed in the ring with Walton. 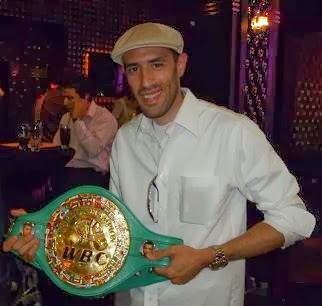 The Brooklyn, New York native has a stellar amateur record of 137 wins and 7 losses. Jacobs' professional record now stands at 17-0, 15 KO's and is steadily improving on his way to a world title shot. Round 1: Walton was using a lot of head movement and swarming in with punches. Jacobs was very composed and feeling Walton out. Jacobs started using his jab and landed more punches as the round went on. Round 2: Jacobs dropped Walton with a stinging left hook to the head. Jacobs started landing hard, crisp punches to Walton's head and body. Jacobs was boxing well and looking for openings to place his punches. With Walton's back on the ropes, Jacobs was just measuring him with right hands. Jacobs threw a left uppercut - right hand combination that almost floored Walton. Round 3: Jacobs nailed Walton with an overhand right and right uppercut. Jacobs stood in front of Walton and was getting the better of the exchanges. Jacobs landed some good body shots and Walton landed an overhand right. Jacobs countered with a left hook to Walton's body. Round 4: Walton's best round was the beginning of the 4th when he landed a good left uppercut to Jacobs' head. Then, Walton landed a solid left hook with Jacobs on the ropes. Jacobs countered back with a hard right and ripped an uppercut followed by left hooks and rights to Walton's head. Rounds 5-7: Jacobs was really starting to break down Walton in the 5th round. Jacobs was using the jab and was firing body shots and landing sharp right hands. From here, Jacobs was really landing clean shots. Walton could not hit Jacobs with clean punches and Jacobs was landing combinations that hurt Walton. A left hook - right combination stunned Walton in round 6. Round 8: Jacobs landed a huge right that hurt Walton. With Walton against the ropes, Jacobs hit him with a left hook-right-left uppercut combination that prompted referee Bobby Ferrara to stop the bout. Danny Jacobs is extremely mature for a 22 year old middleweight contender. He has all the tools to make a potential champion in the near future. Jacobs is poised and looked comfortable as he dictated the pace in this fight. One can observe that Jacobs possesses a deep self confidence that whatever he does during a fight will work against whoever he faces. Jacobs is averaging approximately one fight a month. At this rate, Jacobs is helping his growth as a fighter tremendously. His skills are staying very sharp and his amateur experience definitely helps him with being composed in the ring. Even though Jacobs has kayoed 15 of 17 opponents, he is not a one-punch knockout artist. Jacobs possesses great hand speed and places his punches very well. He can land quick, accurate shots and break an opponent down as each round passes. The future is very bright for this young middleweight nicknamed "The Golden Child".